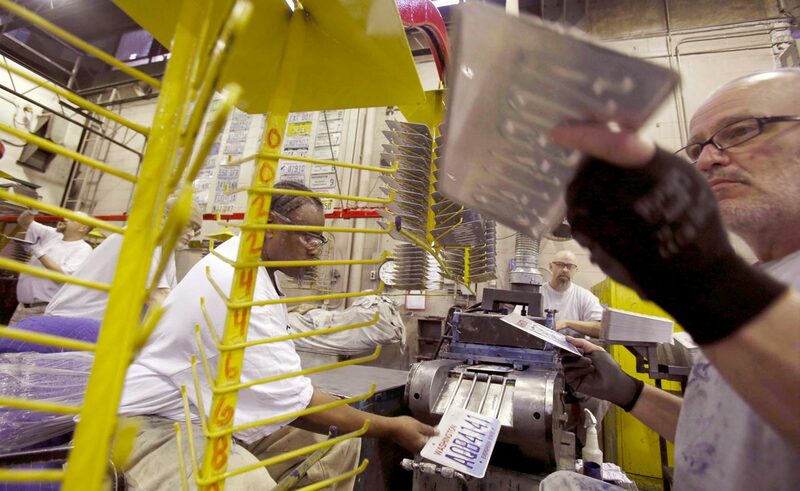 All Washington license plates are made by inmates at the Walla Walla prison. Over the past eight years, Correctional Industries’ profit on the plate business has totaled $5.8 million. 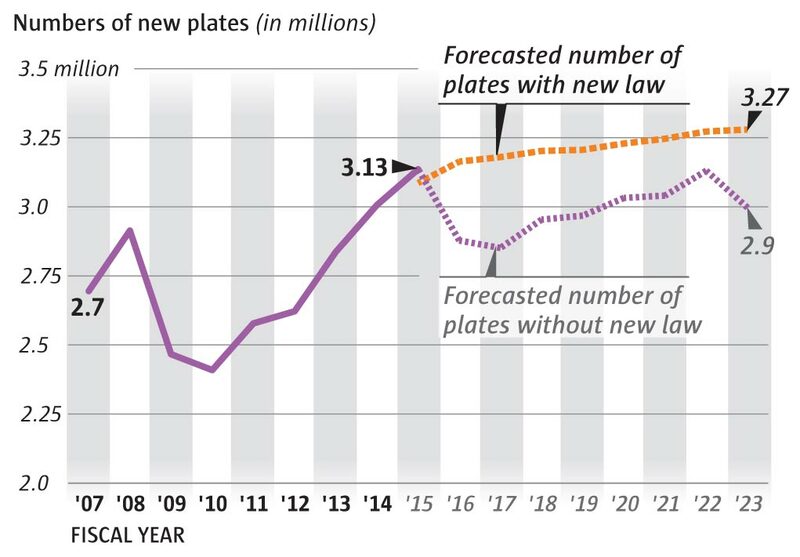 And a new rule means the average Washington motorist may need to buy plates more often. An obscure meeting in 1996 spawned one of the state’s most-hated laws. It’s made millions for the prison labor program, and it’s been a boon for 3M. Drivers have paid the price. Now they could pay even more. Each year, Washington motorists flood state government with complaints about having to buy new license plates every seven years. The discarded plates still gleam like new. People suspect the forced swap is merely a ploy to squeeze them for more tax dollars. Lawmakers heard the gripes and promised to fix the problem. Next month, a new law takes effect that will let you keep license plates for as long as you own the car. No more replacement schedule. No more memorizing a new plate number. But lawmakers weren’t doing you a favor. They knew the change would mean owners will likely end up paying millions of dollars more in the coming years. While the new rule lets you keep your plates longer than seven years, the average driver gets a different car about every five years. Plates will no longer transfer with a vehicle after it is sold. Because of that, Washington motorists over the next five years are projected to buy 1 million additional license plates. Government will benefit from the new millions. So will 3M, which sells the reflective sheeting for the plates. And so will Washington Correctional Industries, the prison-labor program that has turned plate manufacturing into a lucrative business. The push to require plate replacements began in the summer of 1996, when a small study group of Washington lawmakers was hashing out how to curtail the rising number of specialty license plates, such as the one featuring a silhouette of square dancers. At one point, a representative from 3M — a multinational conglomerate involved in producing almost every license plate on U.S. roads — changed the topic. He warned that the 3M coating that made license plates brighter at night wore out over time. The problem with older plates, said David Growe, is that “reflectivity diminishes so much that it basically becomes indiscernible to a driver in lights.” 3M made its case, in part, with hand-drawn charts. The company aggressively lobbied the committee and lawmakers, successfully promoting a bill that required owners to replace license plates every seven years, said former state Sen. Mary Margaret Haugen in a recent interview. She believed 3M’s chief concern was profits. Haugen, a Democrat from Camano Island and a member of the study group, was one of only a handful of lawmakers who voted against the bill. 3M wasn’t the only one lobbying. At the initial 1996 hearing, a representative from the State Patrol, which got a portion of the plate fees, supported 3M’s pitch. Reflectivity was a “significant” factor that helped drivers see other vehicles at night, Capt. Marsh Pugh argued. 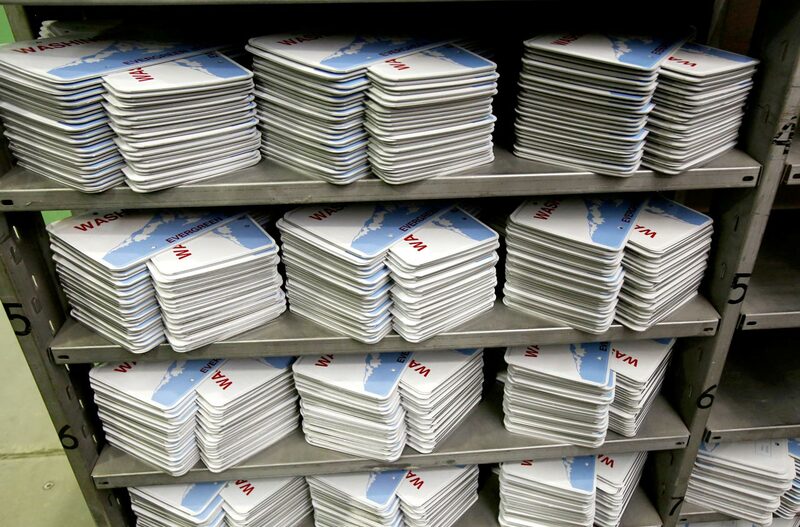 An official with Correctional Industries said plates “represent a significant portion of our business.” The organization was also under order from the Legislature to increase the number of jobs for offenders, CI official Jill Will said. Haugen recalled CI making the pitch to lawmakers that producing more plates was a great opportunity to put more inmates to work. Decisions to replace plates more frequently — here and in other states — have largely been based on dubious safety claims. A few years later, when a Licensing staffer was finalizing the written rules for the replacement schedule, he emailed his colleagues to ask for a copy of the state’s empirical study. “So that you know, there was NO study,” a colleague responded. The state had simply accepted the claims of 3M and looked at other states that were replacing plates. Department leaders decided not to do their own study and “picked seven years” as a replacement rule, the staffer wrote. 3M’s charts had shown that plates lose brightness rapidly, even after the first year, and that almost all brightness was lost by about year eight. 3M still maintains a similar message in lobbying efforts around the country. Last year, in a presentation to Ohio lawmakers, the company again made the case that license-plate readability deteriorates, noting particularly years five to 10. Ohio last replaced its license plates in 2001. But last year’s License Plate Safety Task Force recommended that the plates be replaced regularly — every five to seven years. Montana and Indiana replace them every five. Fanna Haile-Selassie, a 3M spokeswoman, said recently that company testing indicates 3M-coated license plates may lose more than half their brightness after five years and that aging plates “present identification issues.” 3M provides those results to state officials to help them determine “how often drivers should replace their plates,” she said. The first license plates were made by vehicle owners. In the early 1920s, a jute mill at the Walla Walla prison became a license-plate factory, where all the state’s plates are made. The 3M claims have largely gone unchallenged, even though some states don’t have replacement schedules at all. In places like Maryland and California, plates have been on the road for decades without issue. California Highway Patrol officials noted their troopers don’t have trouble reading older plates at night, and neither do the Patrol’s license-plate-recognition devices. Even the State Patrol, which had strongly supported the seven-year rule, has grown indifferent on the issue. Some lawmakers had suggested moving to a 10-year replacement schedule instead. But Lyle Morse, the former director of Washington’s Correctional Industries, said 3M lobbyists encouraged lawmakers in recent years not to tinker with the seven-year rule. 3M has sponsored annual meetings of prison-labor administrators from around the country. 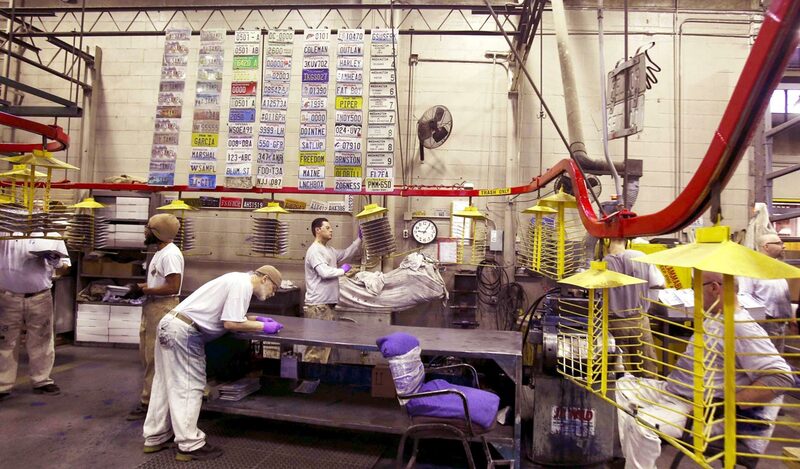 In Washington, 3M provides Correctional Industries with preprinted license-plate sheeting, for which CI pays about $1 million a year, at a cost of 78 cents per linear foot. A new law will allow motorists to keep their license plates for as long as they own a car, but plates will no longer transfer with a vehicle after it is sold. Drivers are projected to pay millions more under the new standard because owners keep their cars on average for about five years. More than a century ago, Washington state’s first license plates were handmade by vehicle owners who painted their state-issued numbers over wood, metal or leather. As vehicle traffic surged, state officials took on the task of producing plates. But, by 1921, so many plates were stored in the basement of the Capitol, awaiting distribution, that their sheer weight was damaging the floor. Around that time, prisoners began manufacturing plates at the penitentiary in Walla Walla. It’s now one of 43 prison factories around the country that produce plates for 40 states and the federal government. Correctional Industries has built the license-plate business into a consistent profit center, averaging 21 percent margins over the past eight years — even after accounting for depreciation, indirect inmate labor costs, janitorial services, disposal fees and utilities. CI’s profit from license plates over the eight years totaled $5.8 million, negating losses in its other lines of business — a tactic previously criticized by the Department of Licensing. CI had just changed its sheeting vendor for the plates and expected to save money on that front, but it didn’t want to pass on the full savings to Licensing. Officials there vehemently objected, saying it was “simply not a good business practice” for CI to profit even more from license plates in order to offset losses elsewhere. Licensing wanted CI to have no more than a 20 percent profit on the plates. CI has exceeded that benchmark in five of the past eight years, including up to 27 percent in one year. However, plates will no longer transfer with a car when the car is sold. The average driver gets a different car about every five years, so the state projects motorists will end up buying many more sets of plates, which cost $24. If you’re selling a car and buying another, keep the plates. For a $10 fee you can transfer them to your new vehicle, saving $14. Bonus: You won’t have to remember a new plate number. Washington state implemented its seven-year replacement schedule at the beginning of 2001. Four days later, Lois Stone was fed up enough to contact the governor. At 69 years old, Stone already owned the modern centennial license plate — a red, white and blue design featuring Mount Rainier. But the state was asking her to buy a replacement. “I live on a fixed income + I’m being forced to spend $7.00 for the same plates I already have on my car,” wrote Stone, then a resident of Newport, a town on the Idaho border north of Spokane. Stone’s note was just the first of many objections now stored in boxes at the state archives. Republicans and Democrats alike found the replacement law to be one of those most disliked by voters. A few years later, when Gov. Chris Gregoire solicited ideas from the public about laws that needed changing, axing the seven-year replacement rule was one of the most popular ideas out of some 2,000 submissions. Sen. Christine Rolfes, D-Bainbridge Island, said lawmakers explored ways in recent years to get rid of the replacement rule but always backed off because it generated so much revenue for the state. When Florida extended its license-plate replacement schedule from six years to 10 years, its prison-labor program lost 10 percent of its revenue. Washington state Sen. Doug Ericksen said he found the way to solve the problem vexing car owners. He proposed the bill to require replacement of license plates only when a vehicle changes hands. “It’s good customer-service policy that we’re putting in place,” Ericksen told his colleagues. His solution sparked enthusiastic bipartisan support. One lawmaker said he was “thrilled” by it. Minutes later, the Senate approved the bill unanimously. But before they voted, lawmakers knew that ditching the seven-year rule would likely result in more plate sales. A 2012 study by a vehicle-data firm found that U.S. drivers keep their vehicles an average of 4.75 years, with people who buy used cars changing vehicles more often than those who buy new. Ericksen also had told colleagues before the vote that Washington drivers keep cars for longer than other states but that his information showed the average length of ownership was 5.6 years. As a result, Washington’s new law is projected to force people to buy 1 million more license plates over the next five years than if the hated seven-year replacement schedule had stayed in place, according to state data. A set of license plates will still cost $24, which includes a $4 “reflectivity fee.” If you want to keep your plates and move them to a different vehicle, you will still have to pay $10. The law also resets the registration schedule of the vehicle every time there is a transaction, so you can no longer buy a vehicle and wait to re-register it until after the previous owner’s paid year has expired. It all means more money for 3M, more money for state agencies and more money for Correctional Industries. Although 3M never testified in favor of the bill, lawmakers in Olympia were well aware of the company’s interest in the issue. Ericksen, a Republican from Ferndale, said he pushed the new license-plate bill after hearing complaints from constituents. He recently said through a spokeswoman that he believes the state’s revenue projections may be high and that the state could reduce how much motorists pay for plates. But he’s also close to 3M’s influential contract lobbyist, T.K. Bentler. Over the past two years, Bentler has treated Ericksen to meals and drinks from restaurants and bars in Olympia on at least 16 occasions. In 2013, Ericksen also attended two barbecues at Bentler’s Olympia home on Puget Sound. The day after the new license-plate bill passed the Senate earlier this year, Bentler held a “cigar night” at his property. Ericksen was one of two senators to attend.